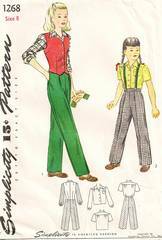 Vintage Simplicity sewing pattern 1268. Slacks have front pleats and side-buttoning waistband. Darts fit weskit at front underarm, back shoulder and waist. Front button closing and V neckline. Blouse has front button closing, shoulder yoke, patch pocket and long or short sleeves. Pattern is used and complete. Unprinted pattern pieces, precut to size.